Great Things He Has Done contains arrangements in contrasting styles that can be used in a wide range of settings, including worship services and recital performances. 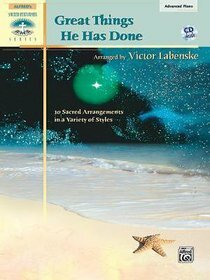 Victor Labenske creatively exploits harmonic, melodic and rhythmic devices while sensitively communicating the hymn texts of each piece. The CD recording with the composer at the piano offers an opportunity to hear these pieces as Victor Labenske intended them. About "Great Things He Has Done (Music Book)"